Central Industries manufactures and markets Sri Lanka's most awarded PVC brand - 'NATIONAL PVC' potable water pipes and fittings. The Company also manufactures and distributes PVC ball valves, PVC solvent cement, rigid and flexible electrical conduits, rectangular snap-on conduit casings, flexible PVC garden hoses, rain gutters, pipes and fittings for rainwater and soil-waste management under the Company’s flagship brand ‘NATIONAL PVC’. PE water tanks and septic tanks are manufactured and marketed under the brand name ‘NATIONAL PE’ and stainless steel water tanks under the brand name ‘NATIONAL SS’. A range of rigid electrical conduits are also manufactured and marketed under the brand name ‘CILTEC’. Central Industries also distributes 'AQUATEC' Water Taps and Accessories. With its wide range of superior quality products of local and international standards, trusted by both professionals and the domestic user, Central Industries caters to a number of industries and applications ranging from residential plumbing to complex agricultural and industrial water supply, drainage projects, water treatment systems, dredging and engineering etc. The Company has an appointed strategic network of Authorized Distributors and Dealers for all its products ensuring island wide availability of its supplies. Established in 1984 as a member of the prestigious Central Finance Group, a leading Finance Company in Sri Lanka, Central Industries is a public quoted company listed on the Colombo Stock Exchange. As Sri Lanka's most awarded PVC brand, the comprehensive portfolio of National PVC, meeting international standards consists of PVC pipes, fittings, drainage, irrigational, sewerage, rain water and roofing accessories, flexible hoses, garden hoses, PE and Stainless Steel water storage tanks, septic tanks, conduits and solvent cement for a wide range of industries and applications. Central Industries pioneered in manufacturing Stainless Steel Storage Tanks in Sri Lanka. National SS storage tanks are ideal for storing water or oil in industrial environments with a high degree of ensuring the highest standards of hygiene. Renowned as a safe and reliable brand of electrical s witches, sockets and accessories, Krypton is a leading brand in Sri Lanka, manufactured by Central Industries. Trusted by professionals for both simple domestic requirements and complex projects, Krypton product portfolio caters to a wide range of applications. Continual research and development carried out by the team of professionals at Central Industries have introduced several products and features that enhance product efficiency. National SS Stainless Steel Tanks are one such innovative product that was introduced to the local market. "NATIONAL PVC BALL VALVE" are the only Ball Valves manufactured in Sri Lanka. The highest standards are maintained and rigorous tests are carried out in manufacturing National and Krypton products in order to ensure persistent quality at all times. The two factories of Central Industries are situated in Keravalapitiya and Elhena, Yakkala within close proximity to the Capital City, Colombo. The factories are equipped with superior German and Austrian machinery with the added strength of a proficient team of highly qualified and experienced professionals assisted by a highly skilled and experienced work force. Customization with logo imprints, specific packaging and distribution are added services that National PVC pipes and Fittings manufacturing division undertakes. 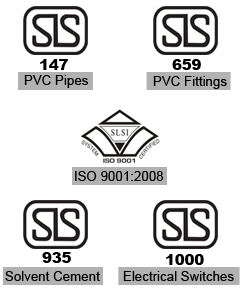 Central Industries was the first PVC pipe manufacturer in Sri Lanka to obtain the ISO 9001:2000 series of Quality Management Certification in 1996. This certification has been consistently maintained and renewed up to date. Product certifications include SLS 147 (derived from ISO 1452) standard for PVC potable pressure pipes, SLS 659 (derived from ISO 1452 ) for PVC pressure fittings and SLS 935 for PVC Solvent Cement. 'Krypton' Electrical Switches (10A), Switched Socket Outlets (5A&15A) and Switched Socket Outlet (13A) carry the product certifications of SLS 1000 (derived from BS 3676), SLS 948 (derived from BS 546) and SLS 734 (derived from BS 1363) respectively for household, commercial and light industrial purposes. Central Industries PLC under takes designing and manufacturing tailor made Rotational Moulded Products/Parts to suit customer specifications. Our in-house Design and Engineering Department is geared to assist and guide you through the varied stages by making a Rotational Moulded Part for any requirement. Our Rotational Moulding Plants can produce small to large, simple to complex products or parts. To be the preferred choice of the discerning customer for products and services in the construction industry. Manufacture and provide products and services of consistent quality and reliability for construction industry.